Sometimes it's best to leave things to the professionals. This is especially true if your area has a thriving Latin American or Caribbean community. But even if it doesn't, there's no reason to fear—just stumble into a place that offers fried pie (yes, it counts). The biggest problem you'll run into here is finding a recipe—there are so many good ones! This isn't to say that you can't experiment and add your own fillings. However, you'll probably want the support of a buddy or two. Aside from helping with prep and clean up, the extra mouths will ensure that you leave the table on your own two feet. Getting rolled away like empanada dough probably isn't the look you're aiming for. Yes, sharing food pics on social media has been done to death. But it's a special day, so why not make an exception? Whether it's a work of art or just a “piece of work”, you'll put a smile on someone's face. Also, if you and your friends tried making empanadas from different countries, it could be interesting to compare the results. Just remember that it's all in good fun, and that there are no winners or losers...except for the people who forgot about this glorious day. They come wrapped in an edible, flaky container, which means you don't need pesky utensils. Doesn't matter if you're at a restaurant or food truck, every bit of goodness will safely reach its destination (psst, that's your mouth). Best of all, they're a breeze to share with your friends...but no one's saying you have to do that. Most people are aware of the meat and cheese variety, but you can stuff empanadas with pretty much anything. This could be sweet potatoes, peaches, or even guava paste. Of course, in these cases they tend to resemble more of a puff pastry. In Bolivia, they like to have the best of both worlds. There you can find salteñas that are filled with a sweet and spicy soup. If that doesn't sound like your cup of tea, we'll take them off your hands (strictly for research purposes). 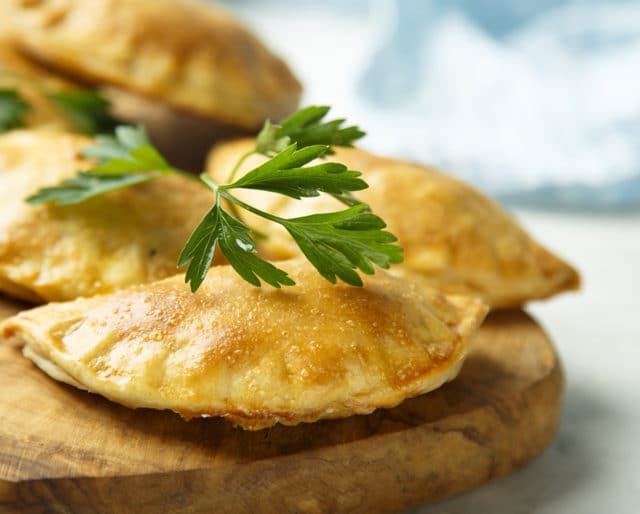 Remember, more than 30 countries have their own version of empanadas, so you're bound to find one that fits your taste. If you can't live without peanuts, you might want to check out Colombia—parts of the country add peanuts and top things off with an aji sauce. Or maybe you can't decide between noodles and bread? In that case, Indonesia has you covered, as their local variety comes chock full of potatoes, carrots, chicken, and glass noodles.